After winter break, the nonfiction unit looms. I don't know why we always schedule it for the long months after vacation, but there it is, waiting for me after my return. I want to make it more fun for me and the students this year, by incorporating the chance to create infographics and to read more interesting stories. Guess what? To be able to recommend books, I need to have read them. 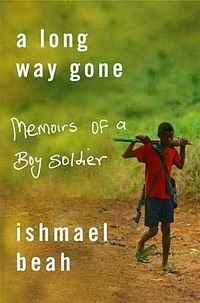 A Long Way Gone is the story of Ishmael Beah, a child soldier from Sierra Leone. This memoir details his life before the country fell apart, his time roving the country as a drug-fueled soldier, and his rehabilitation. Beah has become a spokesperson for child soldiers, someone who has escaped and improved his life. The violence in A Long Way Gone is graphic and descriptive, as it should be. The tragedies that Beah witnessed are unbelievable, and must be shared so that people realize the desperation of the unrest in Sierra Leone. On the other hand, I don't feel comfortable handing the book to my twelve-year-old students. Still, some passages could be used to show how narrative nonfiction can draw readers in and make them want to read more. After finishing the book, I got online to learn more about what is happening in Sierra Leone now. The best nonfiction leads us to more nonfiction. Beah has done this.